What a load of s**t! My life for as long as I can remember has revolved around my toilet habits. When I was really young I suffered from a variety of problems, however it never became bad enough to cause concern. My mum had an ‘old school’ view and didn’t want doctors to, as she put it, ‘prod or poke’ me, so instead it just became a part of my every day life. I fell pregnant after five years of trying – over the moon was an understatement. However, that excitement soon encouraged the world to literally fall, ahem, out of my a**e! At 11 weeks pregnant I ended up in the hospital where I stayed for three weeks. I received a diagnosis of Crohn’s disease. I was initially pleased to have an answer, and “stop making a fuss you’re only pregnant” would become redundant. I didn’t really know what Crohn’s was and after some research my initial positive reaction, soon changed. I learnt that there wasn’t much they could do for me whilst I was pregnant, so instead I adjusted to the disease and learnt to live with it. The first 11 years and nine months had highs and lows, with multiple hospital visits. I would usually be in for couple of days – and after a boost of steroids – I’d be sent on my way. This pattern came to a rather abrupt halt, but with my mum’s 60th birthday around the corner and my Brother’s visit from New Zealand looming, I ignored the warning signs that my body wasn’t coping. As soon as my brother returned home and my mum went on holiday, I knew I had to go to the hospital. I took my daughter to a friend’s house and asked them to look after her for a couple of days. Unfortunately it wasn’t that simple. Once I checked in they couldn’t stop my bleeding and I was visiting the toilet more than 25 times a day. They had one more thing to try before they considered surgery. Cyclosporine was the ‘magic medicine’ that was supposed to help me. They hooked up the drip that night, but an hour later they had to remove it. I’d become hot, itchy and my skin was lumpy – it was clear I was allergic. My last hope was a colostomy bag. I could either have a bag or leave in a box – it wasn’t a difficult decision. My mum had returned from holiday and fortunately I was too poorly to be in trouble for not telling her! My surgery was booked and I just had to make it through one more night. But what a night it was. By the time the surgeon saw me at 8am, I didn’t think I was going to make it. My blood count was only 6.2 at the start of surgery and continued to plummet to 4 which meant I needed a blood transfusion. My mum described me as the same colour as the sheet I laid on. Two weeks before my surgery I met an old lady on the ward who had a colostomy bag. She called hers Fred so that if she discussed it only her loved ones would know what she was talking about. I recalled this story to my Mum and she decided mine should be called Winnie! Winnie the Pooh, it was perfect. I peeled off the bag and started to heave. She laughed and explained “that’s why your a**e is behind you!” I got the giggles, and that was it, I was cured. The next morning I changed Winnie with pride and I was sent home. That’s not quite how the story ends. They were hoping that once Winnie was settled they could create an internal bag and I could go to the toilet normally. Unfortunately a year later the section of bowel they needed for surgery was full of disease. Instead they had to cut it out and sew up my bottom. 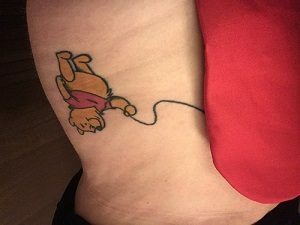 Winnie was permanent, so it was time to become friends. I’m grateful to Winnie every day. We have been together for over 10 years now and I no longer have to plan days around my toilet habits. She certainly saved me from the horrible toilets at Glastonbury! So to all my Crohn’s and Colitis friends, if you are ever faced with the prospect of a bag don’t be scared, it’s a life saver. Hints and tips for the festive season.